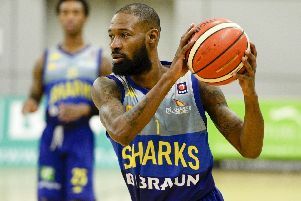 DBL Sharks Sheffield were edged out in yet another close encounter at EIS Sheffield on Saturday night, going down 81-80 to London Lions in the British Basketball League Championship. The third-placed Lions made it seven wins in a row as they chase down Esh Group Eagles Newcastle in the BBL Championship table. It gave the Lions a crucial head-to-head against Sharks, in what was their first win in Sheffield for three years, and only their fourth in 43 visits dating back to 1994. Lions trailed by as many as 14 until Paul Guede hit consecutive three-pointers and 10 total points in a 14-4 finish to the third quarter that got them back to within one shot. From there, the game was destined to go down to the final moments, and it was Justin Robinson who hit a three-pointer for Lions to put them one point up with 24 seconds to go. Mackey McKnight missed a game-winning shot for the hosts. Robinson made what turned out to be the game-winning shot, and finished with 16 points and eight assists. Sharks are next in action on the road on April 17 against Bristol Flyers who are now only two points behind them in the BBL Championship, having played a game less.